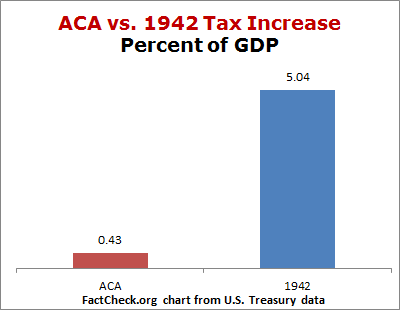 Q: Is the new health care law “the biggest tax increase in history”? A: In raw dollars, perhaps. 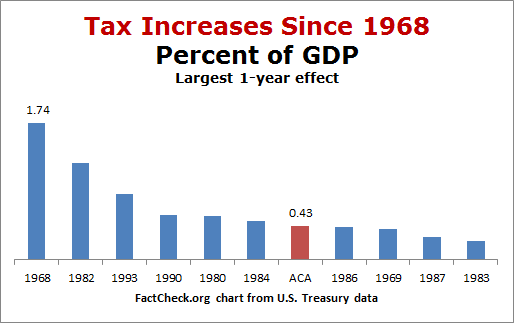 But several tax increases just since 1968 were larger as percentages of the economy, or in inflation-adjusted dollars. Will “Obamacare” be the largest tax hike in US history? We’re not sure Limbaugh meant his statement to be taken seriously; He offered no figures or citations to back up what he said. But other critics of the law have made similar claims. The increase is certainly large. So let’s take a look at how the taxes and fees that finance “Obamacare” stack up against earlier increases. There’s no question that the package of taxes and other revenue-raisers that the law contains constitute a large increase. The most recent estimate from the nonpartisan Joint Committee on Taxation puts the total for more than a dozen different tax increases and other “revenue-related provisions” at $675 billion between now and 2022. And that’s not counting the effect of penalty payments by individuals who refuse to take out health insurance (estimated by the nonpartisan Congressional Budget Office to be $54 billion over the same period. The JCT tax estimate also doesn’t count penalties paid by large employers (those with 50 employees or more). CBO estimates they will pay $113 billion during the period, rather than provide insurance coverage for their workers. But is this increase the largest in American history? Perhaps — as measured by the rather useless yardstick of raw dollars, with no adjustment for inflation. We rely here on recently updated tables from U.S. Treasury Department tax analyst Jerry Tempalski, whose 2006 paper on “Revenue Effects of Major Tax Bills” is the standard reference for making such comparisons. Tempalski (a career employee who has worked in both Republican and Democratic administrations) uses unpublished Treasury Department estimates, which are by no means low-ball figures. Treasury’s figures for the health care law are actually higher than those of either JCT or CBO for the key year 2014, when major provisions of the law take effect. By this measure, the Affordable Care Act’s $76.8 billion in revenue increases tops the $65.9 billion for the highest single year for Bill Clinton’s 1993 deficit reduction bill, which Republicans have for years attacked as the biggest in history. But as we’ve said before, that attack is misleading, and the raw-dollar measure is a poor way to measure the size of a tax increase. For one thing, that measure doesn’t take account of inflation. Using “constant” dollars — all adjusted to equal the value of a dollar in 2009 — the ACA drops to fourth place, and the tax increase signed in 1982 by President Reagan becomes the largest since 1968. But even this measure takes no account of a population that is steadily rising. Today’s population is 82 million higher than it was at the time of Reagan’s 1982 increase, and 56 million higher than it was when Clinton signed the 1993 increase. 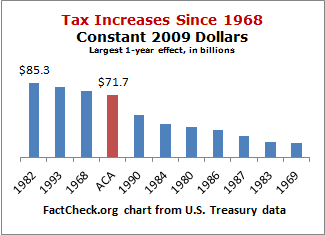 So the average tax increases in those years was accordingly higher on a per-person basis than the ACA. Incomes are also up since those times — even adjusting for inflation, and despite declines since the economic crisis of 2008. So the effect on the average person’s paycheck would be reduced even further, compared to earlier increases. So what is the best yardstick for measuring changes in taxation? “The single best measure for most purposes is probably the revenue effect as a percentage of GDP, because it eliminates the effects of inflation, real economic growth, and the size of total federal receipts,” Tempalski wrote in 2006. We concur, as do most tax experts we know of. And by that measure, the revenue increases in the ACA are smaller than most of the increases enacted since 1968 — and less than one-quarter the size of the largest. None of these comparisons are entirely satisfactory. For example, the 1968 law that we show as the largest, measured by its biggest one-year effect, was a temporary blip. It was Lyndon Johnson’s “Revenue and Expenditure Control Act of 1968,” and was primarily a one-year, 10 percent surcharge on both individual and corporate income taxes that expired in 1969. 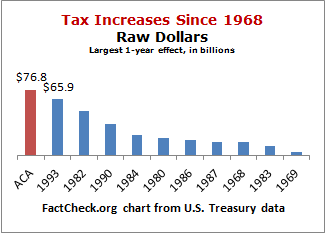 And Reagan’s 1982 tax increase followed an even more massive tax cut the previous year, which had overshot the mark. Taken together, Reagan’s 1981 tax cut and 1982 tax increase still netted out to a very substantial reduction in taxes. Furthermore, Tempalski’s comparative tables look no further than the fourth year after enactment for any of the tax changes it studies. Since some of the ACA’s tax changes are still being phased in during fiscal 2014, the increase may be larger in later years. In short, there are too many moving parts in both the ACA and in earlier tax laws to make simple comparisons that are valid for all purposes. Comparisons of the one-year effect of the ACA’s fifth or sixth year might show it as moving higher relative to earlier laws, but we don’t have fifth-year or sixth-year estimates for those laws to make the comparison, so we can’t say. We have done the best we can using available figures and a consistent methodology. Despite all these uncertainties, one thing is abundantly clear. There’s no way the ACA’s tax and other revenue increases come close to being the largest in U.S. history. That distinction — based on Tempalski’s figures — goes to the “Revenue Act of 1942” which raised taxes by an estimated 5.04 percent of the nation’s Gross Domestic Product in order to finance America’s war effort. The ACA would need to be perhaps a dozen times larger to rival that. Footnote: Some critics of the law use the term “tax” in a very loose way, characterizing the premiums paid to insurance companies by those who choose to comply with the new mandate as a “tax.” We have no quarrel with those who call the penalties themselves a “tax,” as we’ve said previously. But we can’t agree to call insurance premiums a “tax,” any more than we would call them a tax when state governments require auto liability insurance for car owners. Limbaugh, Rush. “The Court Rules: Obamacare is the Largest Tax Increase in the History of the World.” The Rush Limbaugh Show transcript. 28 Jun 2012. Bain, Sam. “President Obama’s crowning achievement: the largest tax increase in US history.” The Daily Caller. 29 Jun 2012. Matthews, Merrill “Is ObamaCare The Largest Tax Increase In U.S. History?” Forbes.com. 29 June 2012. U.S. Congress, Joint Committee on Taxation. “Estimated Revenue Effects of a Proposal to Repeal Certain Tax Provisions Contained in the ‘Affordable Care Act’.” 15 Jun 2012. Congressional Budget Office. “Updated Estimates for the Insurance Coverage Provisions of the Affordable Care Act.” Mar 2012. Tempalski, Jerry. “Revenue Effects of Major Tax Bills; Updated Tables for all 2010 Bills.” Office of Tax Analysis, U.S. Department of the Treasury. Jun 2011. Tempalski, Jerry. “Revenue Effects of Major Tax Bills; OTA Working Paper 81.” Office of Tax Analysis, U.S. Department of the Treasury. Sep 2006. U.S. Census Bureau. “Historical National Population Estimates: July 1, 1900 to July 1, 1999.” 28 Jun 2000. U.S. Census Bureau, Current Population Survey, Annual Social and Economic Supplements. “Table H-6. Regions–All Races by Median and Mean Income: 1975 to 2010.” 13 Sep 2011.